Arnold Schwarzenegger used to be a king of the summer blockbuster, but now it looks like he's picking up his game and moving it to January. The Last Stand, the first movie he's done as a starring role since Terminator 3: Rise of the Machines in 2003, will be out on January 18th of next year and now another one of his upcoming projects has landed in the first month of the year. 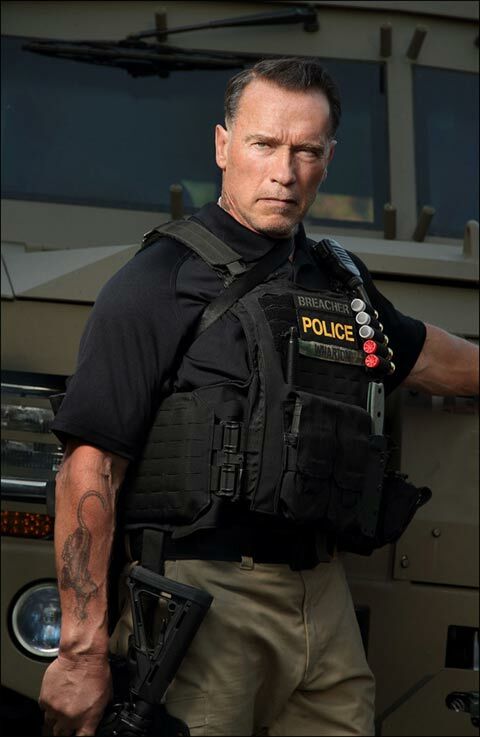 Open Road films is planning to release Ten, the new film from director David Ayer starring Schwarzenegger, on January 24, 2014. Written by Skip Woods (X-Men Origins: Wolverine), the movie is a riff on the the well known Ten Little Indians story and follows an elite task force as they rob a drug cartel safe house while pretending to be on a raid. When they group back together after the hit they think that everything is safe and that they have gotten away with the crime, but then they discover that they're being taken down one by one. The rest of the high-powered cast includes Joe Manganiello, Sam Worthington, Harold Perrineau, Terrence Howard, Josh Holloway, Olivia Williams, Max Martini and Mireille Enos. In addition to the news, the site has also received a new still from the film, which you will notice is quite similar to the one posted back in October. Check it out below and click to see it in high-res. To learn more about Ten be sure to head over to our Blend Film Database.